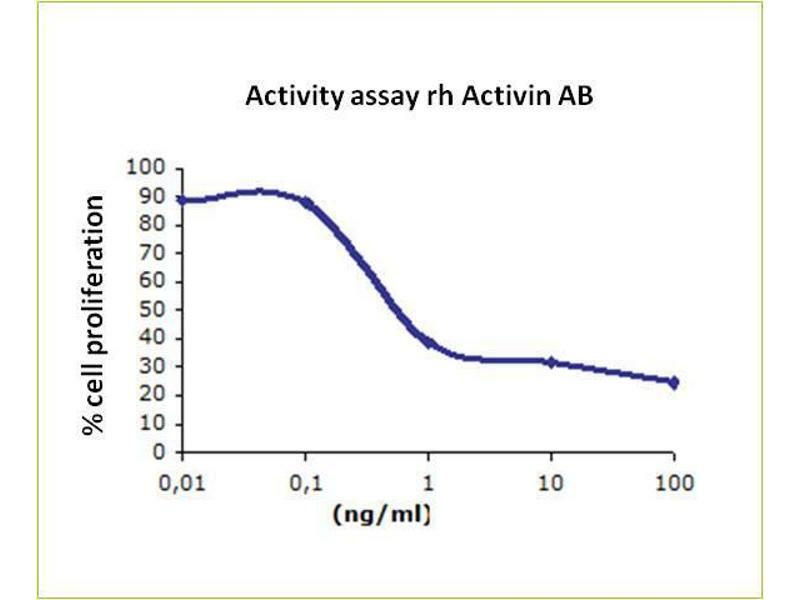 SDS-PAGE analysis of human recombinant Activin AB. Lane MWM: molecular weight marker (kDa). Lane1: 1 µg and lane 2: 2 µg of human recombinant Activin AB. Serological identification. 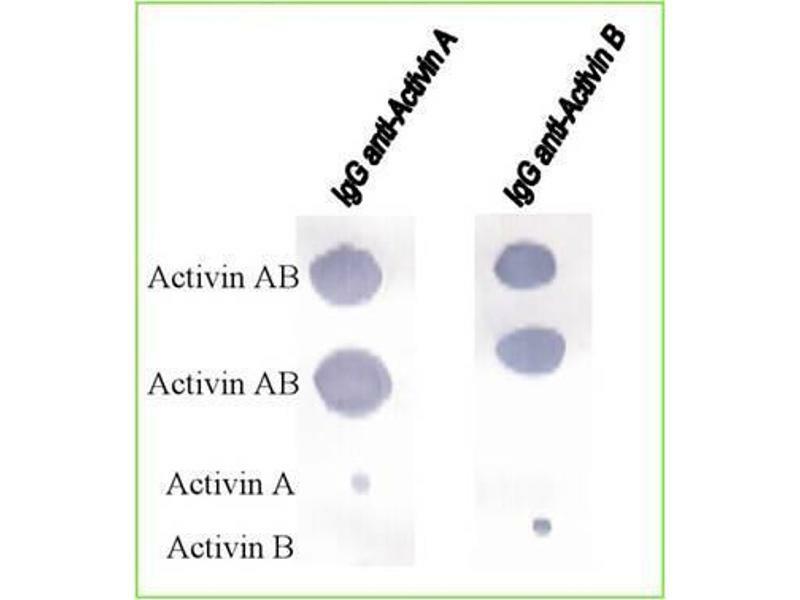 Dot-blot analysis of human recombinant Activin AB, Activin A and Activin B with specifics antisera. 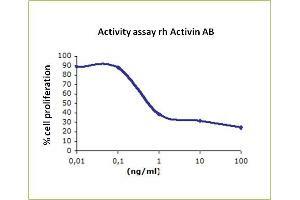 Biological Activity: The biological activity of Activin AB is measured by its ability to inhibit mouse plasmacytoma cell line (MPC-11) cells proliferation. EC50 < 5 ng/mL are required to stimulate a half-maximal response at cytokine saturation. 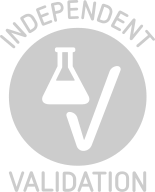 Note: Since applications vary, each investigator should titrate the reagent to obtain optimal results. Activins are homodimers or heterodimers of the various Beta subunit isoforms, belonging to the TGF-beta family. Mature Activin AB has two chains of 116 and 123 amino acids residues (betaA-betaB). Activin exhibits a wide range of biological activities, including mesoderm induction, neural cell differentiation, bone remodelling, haematopoiesis, and reproductive physiology. Activins plays a key role in the production and regulation of hormones such as FSH, LH, GnRH and ACTH. Inhibins /Activins are proteins that are formed by the dimerization of two subunits, i. e. an alpha with either betaA -inhibin A- or betaB - inhibin B. The subunits betaA and betaB can also form homodimers or heterodimers calleds activins: Activin A (betaAbetaA), Activin B (betaBbetaB) and Activin AB (betaAbetaB). The activin gene family comprises the additional, but poorly characterized members activin betaC, betaD, and betaE. - As with other members of the super-family, Activins interact with two types of cell surface trans-membrane receptors (Types I and II) which have intrinsic serine/threonine kinase activities in their cytoplasmic domains, Activin type 1 receptors, ACVR1, ACVR1B, ACVR1C and Activin type 2 receptors, ACVR2A, ACVR2B. - The development of assays distinguishing between different forms of activins and inhibins, along with knock-in and knock-out models, have provided evidence that the betaA- and betaB-subunits have independent and separate roles physiologically. Additionally, evaluation of ligand-receptor interactions indicates significant differences in receptor affinity between activin isoforms, as well as between inhibin isoforms. Activin AB is a disulphide linked heterodimer of subunits betaA / betaB . BetaA Single chain, containing 116 aa (13.7 kDa) and BetaB single chain, 123 amino residues (14kDa). Recombinant human Activin AB contains a His-tag at the N-terminal end. Human recombinant protein expressed in Nicotiana benthamiana. It is produced by transient expression in non-transgenic plants and is purified by sequential chromatography (FPLC). This product contains no animal-derived components or impurities. Animal Free product. The protein was resolved by SDS polyacrylamide gel electrophoresis and the gel was stained with coomassie blue. Reconstitution Lyophilized protein should be reconstituted in water to a concentration of 50 ng/µL. Optimal concentration should be determined for specific application and cell lines. Optimal concentration should be determined for specific application and cell lines.